Mr. Fisher has honored the Dallas Business Club as his platform to deliver his final Economic Update of 2014 for the Texas Economy. Chatham House Rules have been lifted and the press and media will be present. The final menu has been chosen, seen below. This is a very rare opportunity for members of the Dallas Business Club MBA Community. Mr. Richard Fisher has chosen our venue as “just the right audience” for the delivery of his final Economic Update of the year, only shortly before his announced retirement. Due to anticipated demand, space has been increased and the registration deadline is extended. Mr. Fisher is truly a citizen of the world. He was born in Los Angeles, grew up in Mexico and has been on the move ever since. His father was Australian and his mother was South African of Norwegian descent. He graduated from the Admiral Farragut Academy, then attended the US Naval Academy in Annapolis for two years before transferring to Harvard University, where he earned his bachelor’s degree in economics. He then pursued Latin American studies at Oxford before entering and graduating with an MBA from the Stanford University Graduate School of Business. He has moved back and forth between the private and public sectors with equal ease. He was first with Brown Brothers as assistant to former Undersecretary of the Treasury Robert Roosa, then served as Special Assistant to Secretary W. Michael Blumenthal at the US Department of the Treasury before returning to Brown Brothers in Dallas. He created Fisher Capital Management and Fisher Ewing Partners. 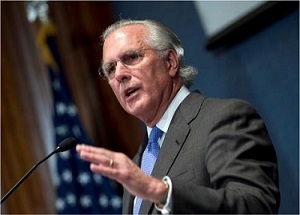 From 1997 to 2001, he served as Deputy US Trade Representative to Charlene Barshefsky where he was responsible for the implementation of NAFTA and created bilateral accords admitting both the People’s Republic of China and Taiwan to the WTO. He has twice been candidate for the US Senate. Tickets are very limited for this event, so please register early. Also, absolutely no unregistered walk-ins will admitted. “Chatham House Rules” are no longer in effect and members of the press and media will be present. Hint: Become a Platinum member before you register for this event and receive a $10 discount! Renew here! Absolutely no walk-ins for this event. Government-issued Photo ID is required for admission to the building. Registration will close at 5pm on December 1st. Recception Service: Southwest Wrap Grilled Chicken, Citrus Grilled Shrimp with Ancho cream, Fresh Fruit Crudites, Spicy Chicken Fingers, Louisiana Crab Cakes with Remoulade Sauce and Mini Taquitoes with Salsa. Beverages include soft drinks and bottled water.